Can ignorance help you learn English? On today’s Deep Thoughts Thursday, learn the secret to success, and how you can apply it to learning English! Should you connect not perfect your English for the IELTS exam? Today, learn how to connect with the examiner, and something you probably don’t know about the exam day schedule! In the IELTS, you’re not graded for being perfect. You’re graded for communication ability. It’s important to understand that this is connection, not perfection. After you complete the Reading and Writing sections, there will probably be some waiting time before the Speaking section of your test. While you’re waiting, don’t get nervous! Instead, keep in mind that the examiner is not expecting you to be perfect. He or she only wants you to communicate your ideas the best you can. They want you to be able to connect with them. Does connection not perfection work for you and your English learning? How will you use it with your IELTS examiner? Are you stuck on the rules of English? Today, Lindsay and Michelle discuss how to go from obsessing over the rules, to freeing your mind to get more creative with your English! Come back to our website for more! Do you need some phrasal verbs for the IELTS exam? Today, Lindsay and Jessica share 5 English phrasal verbs you can use to stand out and get the score you need! You will probably be asked to talk about the topics of home, shopping, food and studying in Part 1 of the IELTS Speaking Section. You need to prepare for this. One way you can do that is have some phrasal verbs. Phrasal verbs are a way to sound more natural and native when speaking informally. Though there are many of these to choose from, you only need to use of a few to stand out. AEE 261: How to Arrive at a More Natural English Level without Using the Verb "ARRIVE"
Are you using the verb “arrive” correctly? On today’s Tear Up Your Textbook Tuesday, learn when to (and when not to) use the verb “arrive” with native speakers! For a native English speaker, “arrive” is not always the most natural-sounding word to use. It probably fits best in formal situations, such as a job interview or a speech. Instead of “When did you arrive?” a native speaker might ask “When did you get here?” or “When did you get in?” Both mean the same thing as “arrive”, but are more common. How can you use “get” instead of arrive? Show us what you’ve got in the comments section below! Today, Lindsay and Michelle discuss why a few towns in the United States are banning a common winter activity for kids! Most Americans live in places that get snow in the winter. As children, they probably went sledding at least a few times. But today, some places are trying to ban sledding because it can be dangerous! Towns with sled hills are afraid somebody will get hurt, and the town will be sued. Some lawsuits are justified, but there is such a thing as a “frivolous lawsuit,” which is a lawsuit that has little merit but is being pursued for money, rather than justice. What do you think about banning sledding? What do think about suing a “haunted house” park because it’s too scary? Do you try to speak fast to sound like a native English speaker? Today, Lindsay and Jessica discuss why you shouldn’t leave your heart behind on the IELTS Speaking Section! Nobody expects you to sound exactly like a native speaker. People just want to understand you. So if you’re talking too fast and trying to sound like a native, you might actually become more difficult to understand. Speed is not important. If you speak with clarity and confidence, you will always sound better than if you’re in a rush. You have to be able to relax, pause between sentences, and use intonation and emotion. If you want a high score on the Speaking Section, the examiner must be able to understand what you’re saying. Intonation is important — practice expressing your feelings so you DON’T sound like a robot! How are you going to speak English with your heart? How many words should you learn at a time? On today’s Wisdom Wednesday, Lindsay and Michelle talk about why it’s important to pace yourself so you don’t get overwhelmed! Are you afraid of being asked an unfamiliar question in the IELTS speaking section? Where do you find inspiration to learn English? Today, learn 3 places where you can find compelling, interesting content to move you to the next level! We live in a time of abundant online resources for learning English. In fact, there are so many that it can be overwhelming! But Thaddeus believes finding the right ones are the key to keeping your interest so you stay motivated. How do you use “as long as” in English? On today’s Tear Up Your Textbook Tuesday, find out how to stop using “if” all the time and start using “as long as”! The phrase “as long as” is a connector similar to “if”, or “provided that”. It means that meeting certain conditions will allow something to happen. The emphasis is on the importance of meeting the conditions. When do I have to be home? Whenever you want, as long as you bring the car back in good condition. How can you use “as long as”? Write us a sample sentence in the comments section below! Did you know there are differences between British and American English? Today, Lindsay talks with teacher and author Douglas Amrine about three key differences, and why these matter for you in a job interview! Douglas has spent half his life in the United States and half in the United Kingdom, so his accent is somewhere in the middle of the two. His experience has given him clarity about the differences in how Americans and British speak, and how speech is perceived in each country. What’s the difference between deceived and disappointed? Today, Lindsay and Michelle discuss these two words, and how ‘false friends’ from other languages might cause trouble when translating! Ever thought of going to Austin, Texas? Today, Lindsay talks with Tyler Lockett from Austin about why that city is unique and “weird,” and how you can connect with locals using three phrases! Does your English sound natural? Or do you sound like a textbook when you speak? Today, get 7 tricks to update your English and sound more natural by using real talk instead of textbook talk! Speaking natural-sounding English can be difficult when you only work with textbooks. While what your textbook says may be technically correct, some of the phrases might sound outdated or odd to native ears. Here are 7 ways your textbook might tell you how to say something, as well as the ways a native English speaker would really say it. Real: Hi!, Hey!, or What’s up? Textbook: Are you having a good day? Real: Having a good day? Textbook: How are you?, How do you do? Real: How’s it going?, How you doin’?, or How’ve you been? Real: Doin’ well., or Not bad. Textbook: What are your hobbies? Real: What do you like to do?, What are you into?, or What do you do for fun? Textbook: I wish to (do something). Real: I wanna (do something), or I’d like to (do something). Real: See ya., Take care., or Bye. Do you speak textbook English? Do you know any other differences between what your textbook says and how native English-speakers speak? 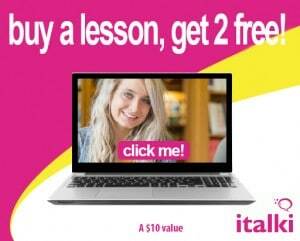 Are you ready for an italki challenge to push your language-learning forward in 2015? Today, learn how to take action and bet on yourself with an amazing opportunity! Every challenge you face is like putting a bet on yourself. But the only way to really lose is if you don’t even try. This month, the italki.com Language Challenge can help you improve your English in a serious way. A $10 sign up fee gets you into the game. If you can complete 20 lessons (20 hours) with an online teacher by the end of February, italki will pay you $40 back in credit. This comes out to 3-4 lessons per week. Can you handle that? Essentially, you are placing a bet on your commitment to learning English! Motivation: All of us need to be pushed sometimes, and there’s never better time than NOW! Defining your goal: Learning English is a lifetime project, but having defined goals will bring clarity to your progress. Social experience: Even though you could do this by yourself, being accountable to others will focus you and help you follow through to the end. Ready for the challenge? Sign up at allearsenglish.com/italki. Are you signing up for the challenge? Share your goals in the comments section below! Kevin Chen is an entrepreneur based in Shanghai, China. He is co-founder of italki.com, a language learning community marketplace that connects students and teachers from around the world for online language lessons. italki has over a million users, thousands of teachers, and thousands of language classes are scheduled through the site every day. Kevin is also an organizer of Techyizu.org, a non-profit group that organizes startup and technology events in Shanghai, including Barcamp Shanghai and Designing Shanghai. Kevin previously co-founded Famento, a startup focused on recording family history. Before that, Kevin worked in the finance industry as a research analyst for Lehman Brothers and Merrill Lynch. He has a masters degree from the London School of Economics, and a bachelor’s degree from Georgetown University. Do you know how important it is to show charisma in American English? Today, Lindsay and Michelle talk about why it’s important, and give you three ways to be charismatic in English! Today, get two quotes by two famous entrepreneurs, and learn how to talk about the impact you want to make on the world in 2015! Today, Lindsay chats with Marianna Du Bosq, a bilingual educator who has three ways to help you raise your child to speak more than one language! The benefits of raising a bilingual child are many. Not only will knowing more than one language open career opportunities for the child when they grow up, research is also finding significant positive cognitive advantages to having a bilingual brain. Expose your children to quality language input. Read books, or even use audio books. This way, your child is hearing voices other than those of their parents. Create a need to use the language. If the child doesn’t have to use the language to get what they want, they’re naturally going to fall back on using the dominant language. Ask your family members help by only speaking one language or the other. Keep it fun! Children will be far more involved in the language if they are doing the kinds of things they already love to do. Are you a parent interested in raising bilingual children? Share your thoughts or experiences in the comments section below! Marianna Du Bosq is a bilingual mother, former bilingual educator, and lifetime language learner. She is the host of the Bilingual Avenue podcast and blog where she interviews parents and experts raising and teaching multilingual children, and provides an excellent collection of tips and strategies for anyone choosing this journey. She is originally from Venezuela, has spent the last twenty years in the United States, and is currently on a one year adventure in the Black Forest in Germany with her husband and two year old daughter. How do you use the word ‘even’ in English? On today’s Tear-Up Your Textbook Tuesday, Lindsay and Michelle talk about four situations for using the term ‘even’, and how to use your tone of voice to make it work in an English conversation! How do you declare a New Year’s resolution in English? Today, Lindsay and Michelle discuss five easy English phrases to use for your intentions in the new year!